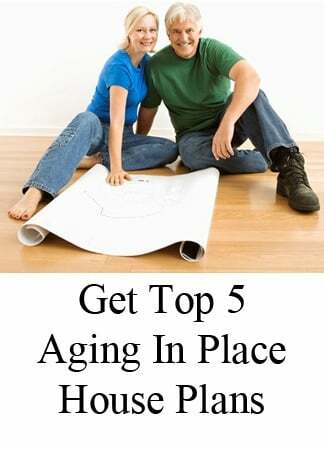 White is the number one color request for modern farmhouses to be built in 2019. 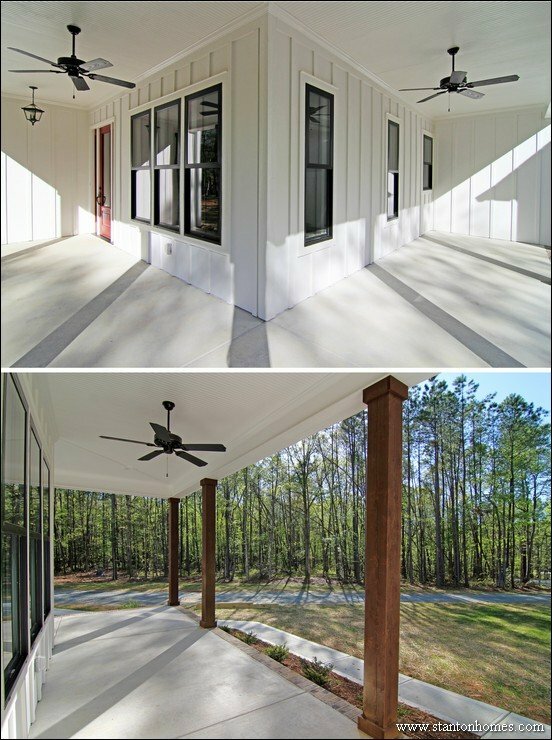 Big covered porches are the most popular feature in modern farmhouses to be built in 2019. Dormers say "countryside" to many modern farmhouse owners - another big trend in 2019. 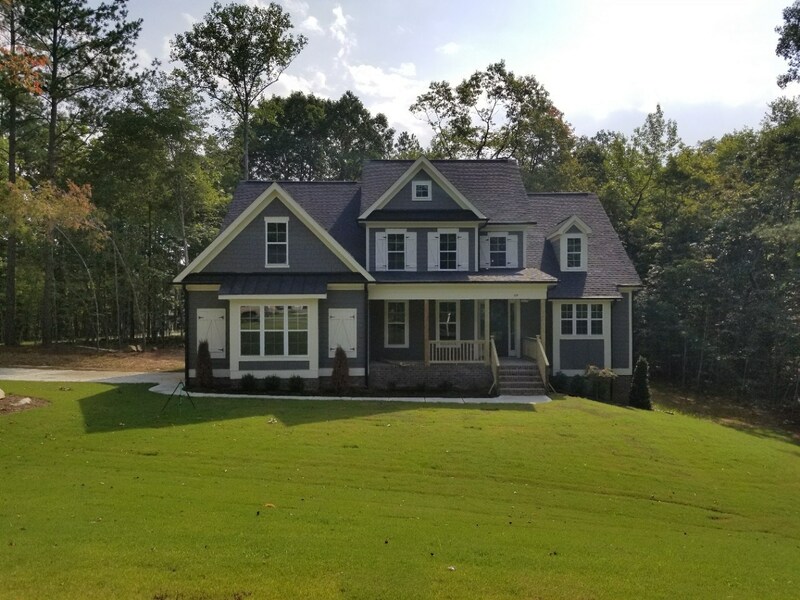 Metal roofs are back in 2019 - especially as accents, like this Raleigh custom home. 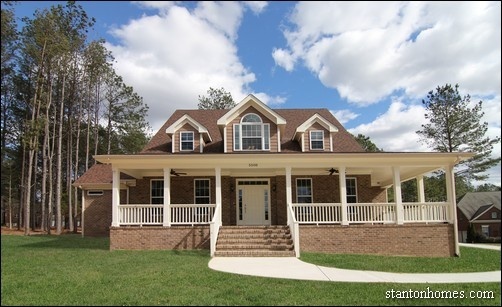 Take it outside, with the comforts of a big screen porch. Big trend for 2019. Beam in, with an open kitchen/great room. Still standing strong as a top request in 2019. The kitchen is overwhelmingly the favorite home hang-out place. A big island makes it fun. 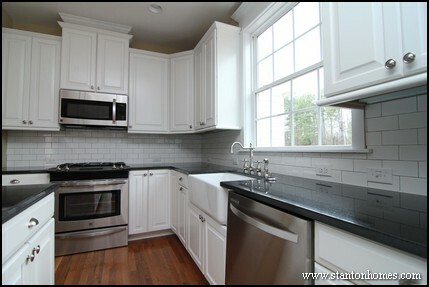 Clean and bright: White wins again for kitchen cabinetry in modern farmhouses. Exaggerated lighting is a new trend for 2019, like this country kitchen. Make room for more pantry and storage space in 2019. 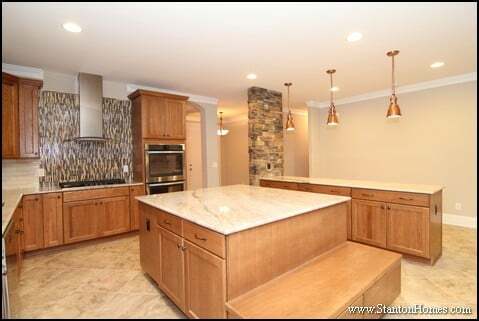 Custom built Stanton Homes can even stagger your shelves, cabinets and drawers to fit your food storage needs. 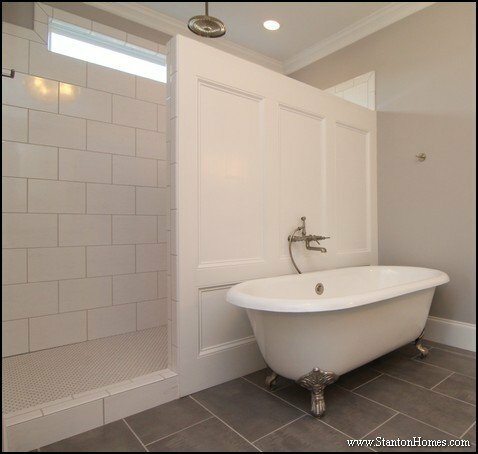 This Chatham Country modern farmhouse illustrates the sought-after simplicity of a classic bathroom. This modern farmhouse fills up wall space with places to put things. 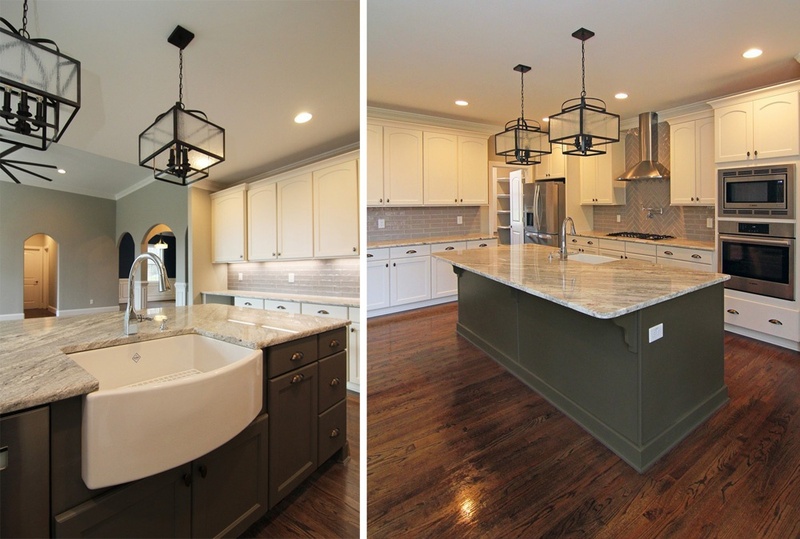 Finding more places for tucking things away is another big trend for 2019 in NC new homes. Custom homes can be designed with personal features that fit the simplistic style of a modern farmhouse, like this custom built wine rack. 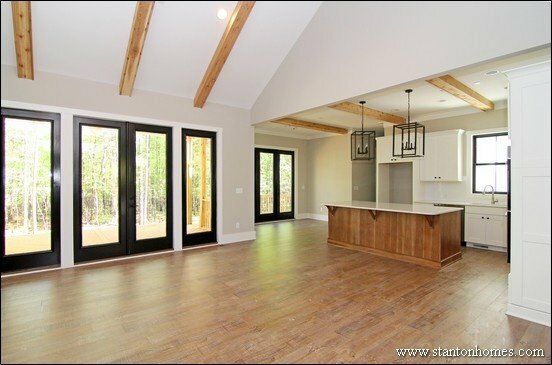 Real hardwood floors remain a solid choice for NC modern farmhouses in 2019. Wainscoting isn't just for Dining Rooms in 2019 - here's how it looks in a country style bathroom. 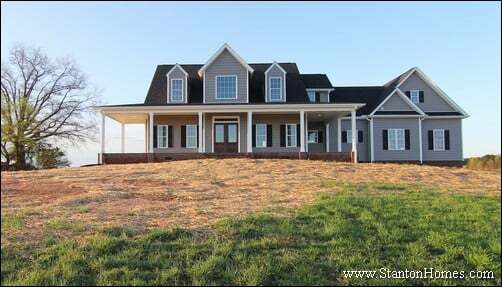 What makes White Country Farmhouses the most popular architectural design for custom homes in NC? 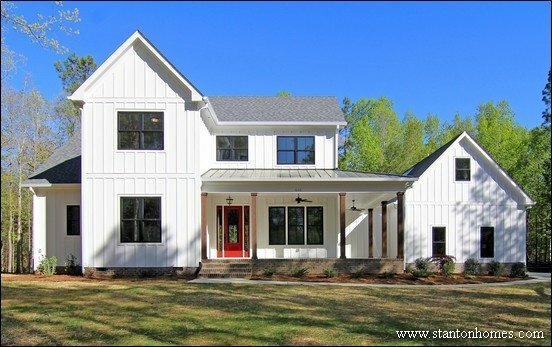 White Modern Country Farmhouses are one of the most requested custom architectural designs in North Carolina right now. Whether prompted by a homebuyer’s return to nature, yearning for a simplistic life, or comfort inspired by a country home, White Modern Country Farmhouses are a popular blend of contemporary and traditional artistry that's in high demand. Here are 19 features common to modern country farmhouses, with photos from new Raleigh white modern country farmhouses. Although modern country farmhouses can be painted any color, white is by far the most poplar color. Whether it speaks to the quest for purity in lifestyle or merely harkens to a sense of simplicity, many homebuyers believe white is just right for this architectural style. Dormers are often a feature of modern country farmhouses. They serve to break up the roofline, bring additional natural light into the upper floor, and add country appeal. 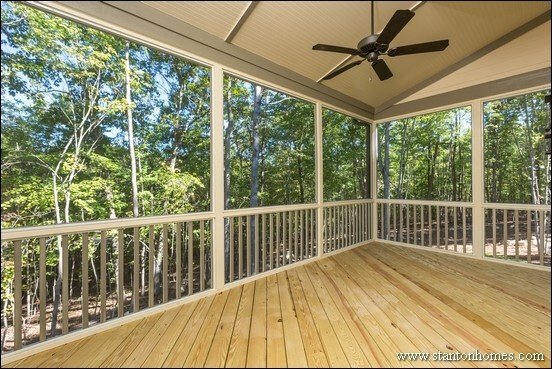 A big screen porch is another way of adding outdoor living to a home that’s especially popular with modern country farmhouse plans. They add more ability to enjoy the countryside – in a relatively contained environment. The simplistic nature of a modern country farmhouse encourages get-togethers. 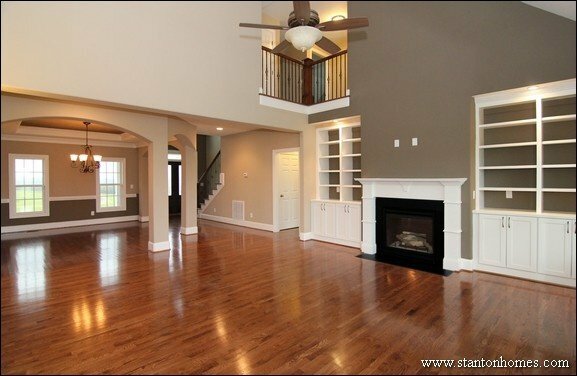 There is a lot of emphasis on big spaces for gatherings, with focus on the kitchen and great room. The beams across two ceilings in this photo also illustrates the appeal of wood in this style of home. Big islands are a constant in modern country farmhouses - serving as a gathering place as well as a focal point, with large surfaces designed for multiple activities. In the photo below of a modern country farmhouse kitchen, the built-in bench is part of the island cabinetry. 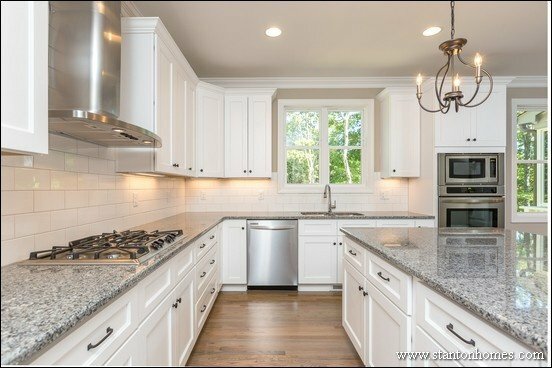 The clean and basic nature of a white modern country farmhouse design is often continued inside, with white cabinets the number one choice for kitchens and bathrooms. 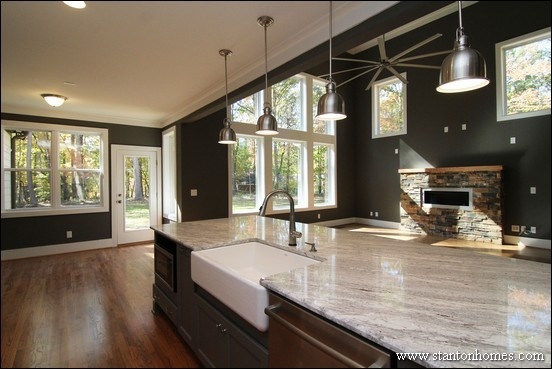 Exaggerated lighting is a common request for modern country farmhouses, like this photo of pendant lights over the kitchen island. 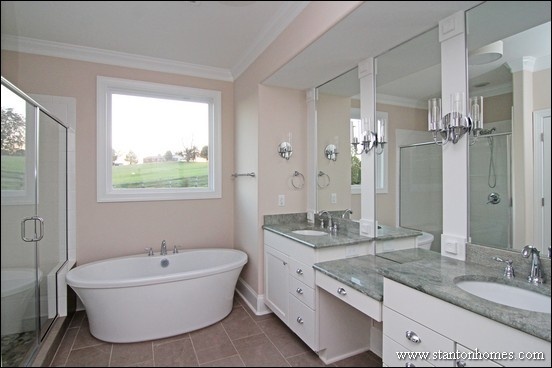 Note the apron front sink, too - read on for more photos of this highly sought after feature in custom homes. With all the family and friends that love to hang out in your new home, you’ll need a big pantry with custom storage – one of the most popular features in most modern country farmhouses. 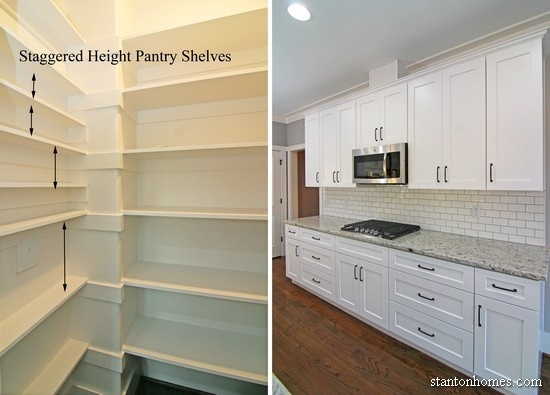 This pantry photo illustrates how shelving can be designed to fit the kinds of products you want to place there, when you build a custom home. The simplistic nature of a modern country farmhouse continues in the master bath, where bathtubs can be whimsical or contemporary with equal ease. Since many modern country farmhouses are built in the countryside, it isn’t just a quest for more sunlight that makes lots of windows a popular request. It’s also a feeling of being one with nature – without neighbors a fraction away to block the view. Countryside living can mean more mud and more clutter to drop off at the door. 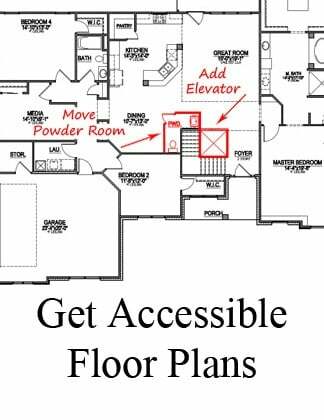 Drop zones are one of the most sought after features in every new home – but in modern country farmhouses, they can seem essential. 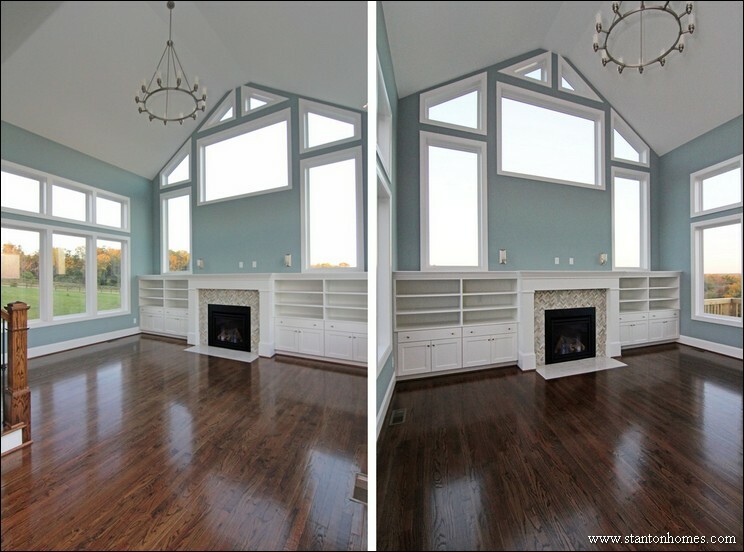 As you can see in these photos, built in storage is tucked into a variety of rooms in many modern country farmhouses. Each cubby, shelf and cupboard is designed for the use of its placement, in today’s custom homes. Big spaces that define modern country farmhouses don’t stop with window walls and gathering spaces. Raised ceilings in great rooms, master suites, kitchens and other rooms are also designed to create a feeling of spaciousness. 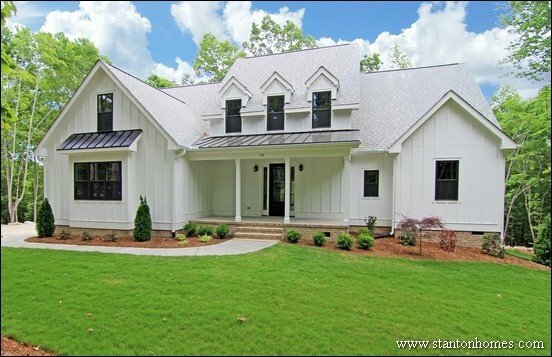 Whereas most custom homes come with two piece crown molding, modern country farmhouse trim packages can be more subtle with simple, straight lines. Ship lap is another popular trim trend for Raleigh white farmhouse designs. 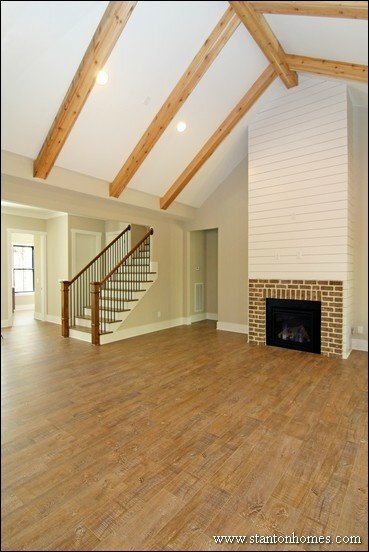 And here are more of the wood beams that can add a rustic or contemporary touch to custom homes. Hardwood floors are the most popular choice of flooring in modern country farmhouses, especially in all of the main floor gathering areas. It’s easy to clean and has natural wood appeal intricate to country living. 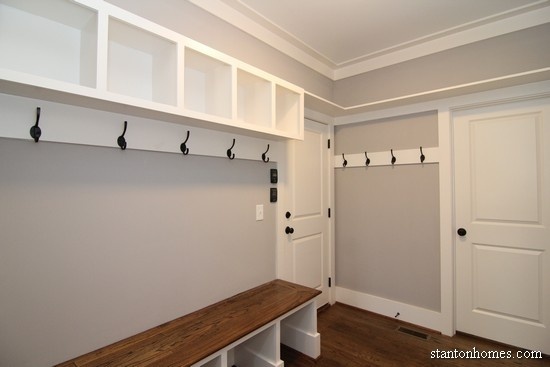 While not all walls in modern country farmhouses are white (grey is actually the most requested color right now) it’s common to have a specific wall with wainscoting, board and batten, or ship lap that adds personality and draws the eye to a specific area. What is the best color for a Farmhouse Exterior? Which exterior colors are the most popular for a farmhouse style home? 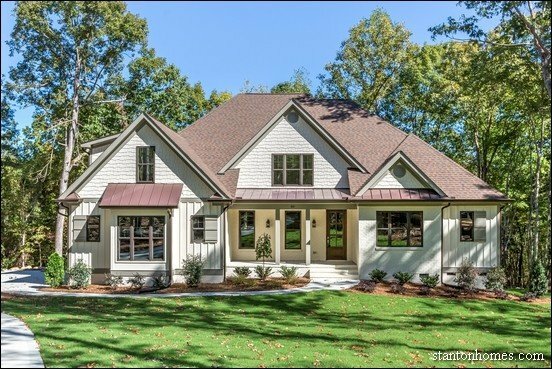 Which are more requested in Raleigh new homes? 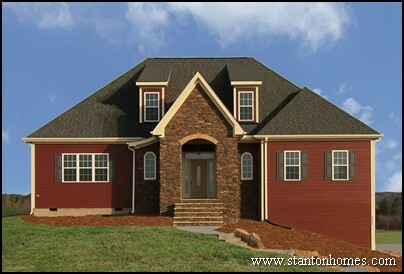 See photos of brown, tan, white, yellow, red, and gray farmhouse exteriors below. 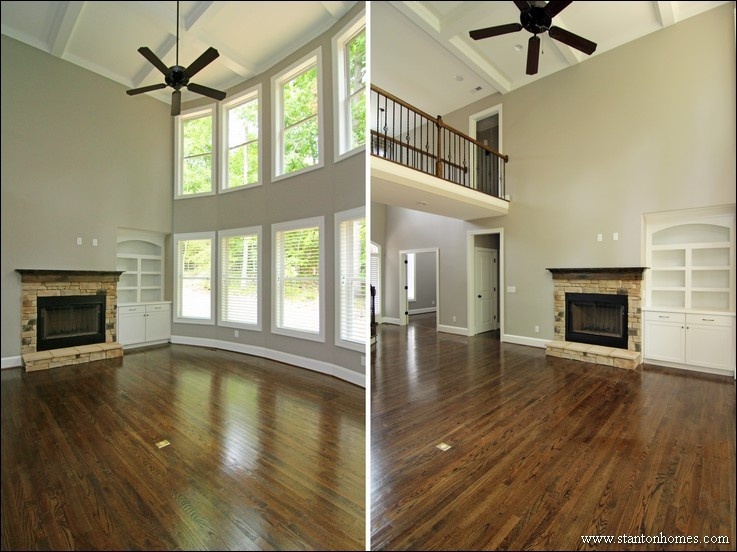 Two story farmhouse floor plans are built for family and friends to gather - with a spacious kitchen, open great room with cozy fireplace, and dining area large enough for a long farmhouse table. This Raleigh new home, a version of the Daniel, has an old-fashioned sense of home with a lot of modern updates. 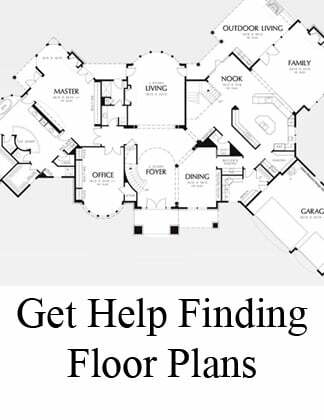 See interior farmhouse photos of these farmhouse floor plan elements, in the Daniel. From the white apron sink in the island kitchen to the light blue master bath with cantilever tub, this first floor master suite home speaks to a classic farmhouse style. 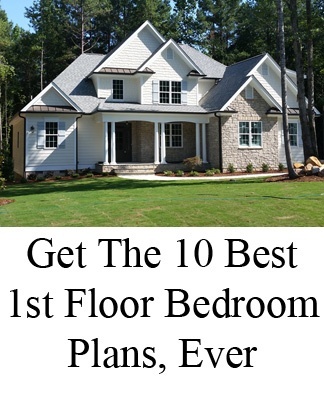 See interior photos and get the floor plan for this white country farmhouse, the Carwile, here. This yellow farmhouse exterior stands out, with double window dormers, a rocking chair front porch, black shutters, and sunburst window above the red front door. What's the difference between "American" and French Country farmhouse designs? The nonsymmetrical curved roofline, strong red siding color, steep pitch roof, small pane windows, and stone accents are French Country exterior design elements. See a photo gallery of this red French country farmhouse, the Country Manor, here. 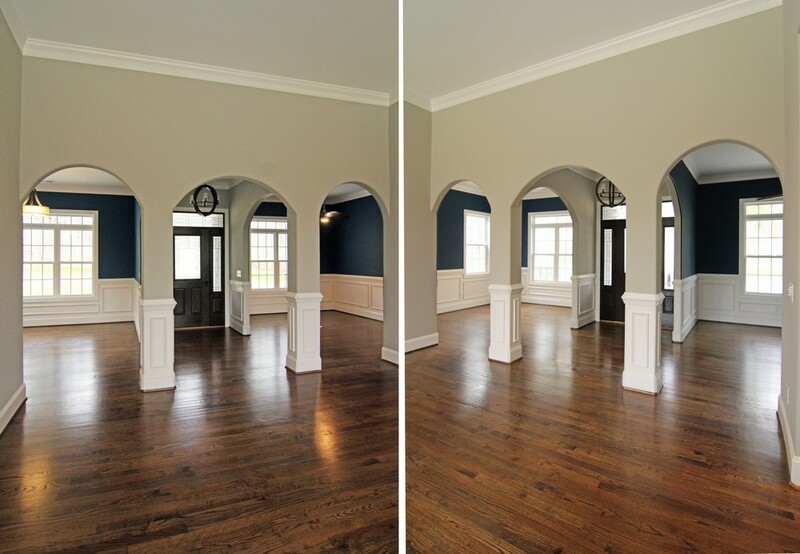 The vaulted great room opens to the island kitchen, breakfast nook, and formal dining. 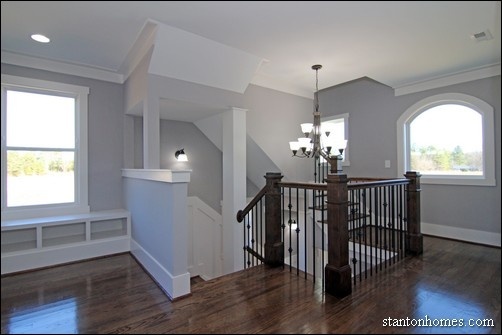 A first floor master suite has an elegant trey ceiling, his and hers walk in closet. The island kitchen also offers a "Costco size" walk in pantry, with mud room style laundry around the corner. See interior photos of this traditional farmhouse, the Low Country Farmhouse, here. 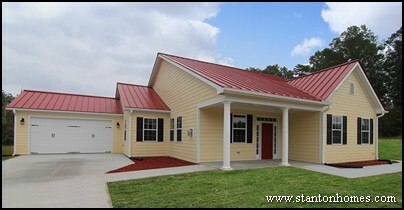 It's hard to find a more traditional look than a yellow farmhouse with red metal roof. Reminicent of a barn, this Raleigh farmhouse style home is fully wheelchair accessible - from the concrete path that leads from the front patio to the backyard to the kitchen, bathrooms, hallways, and living areas. See a photo gallery of this yellow farmhouse, the Blackhawk - click here. This Farmhouse plan has a traditional feel inside and out with a main floor master suite, large kitchen island open to the great room, separate dining and breakfast rooms, and three secondary bedrooms upstairs with a small loft overlook to the vaulted great room. The front porch wraps around three sides of the home, with a separate covered patio in the backyard. See interior photos of this traditional farmhouse, another version of the Low Country Farmhouse, here. What color would you pick for your farmhouse? Vote here! 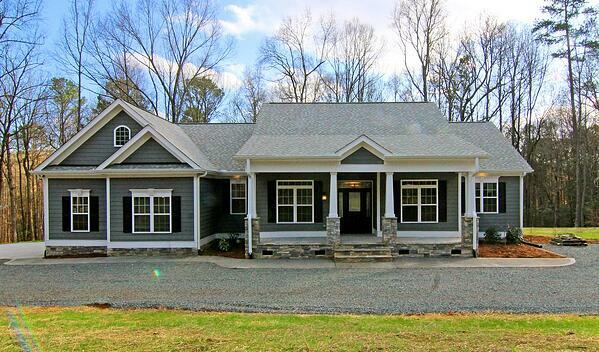 Do you want to live in a Raleigh Farmhouse style home? Which exterior paint color are the most traditional for a farmhouse? 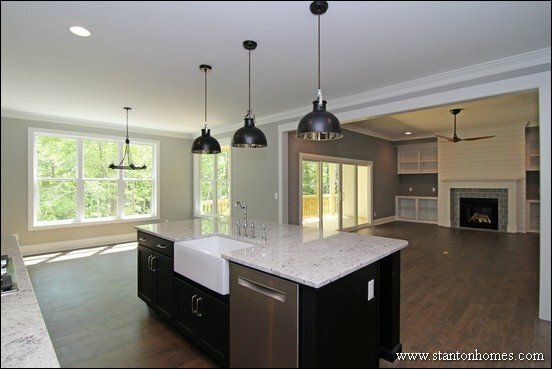 Which are more popular in Raleigh new homes? See photos of white, yellow, red, gray, and beige farmhouse exteriors below. 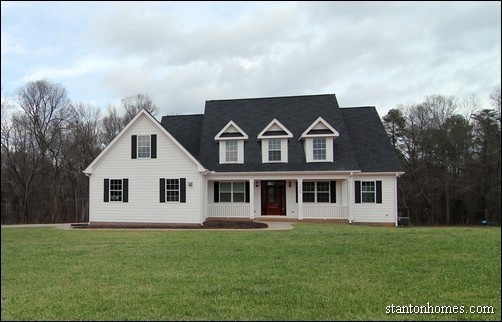 See interior photos and get the floor plan for this white country farmhouse, here. 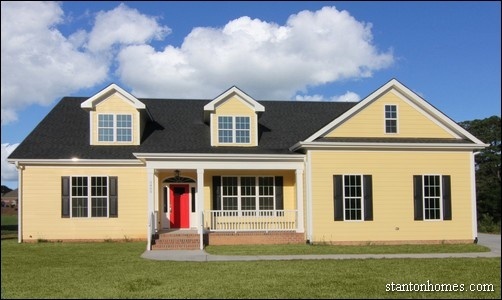 See a photo gallery of this yellow farmhouse (and get a floor plan layout) - click here. Interior photos include an island kitchen, rustic "pantry" glass door, dining room nook, barrel vault hallway, and wheelchair accessible bathrooms with roll-under cabinets and zero threashold showers. See a photo gallery of this red French country farmhouse, here. See interior photos of this traditional farmhouse, here.